Welcome to Edition Güntersberg, the music publisher from Heidelberg, Germany. You can find all sheet music that we offer in our catalogue. 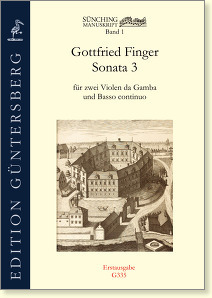 Güntersberg is publishig selected pieces for two violas da gamba and basso continuo from the Sünching Manuscript by Gottfried Finger. The bass was added by Wolfgang Kostujak. Now are available Sonata 3 and Sonata Augustiniana. 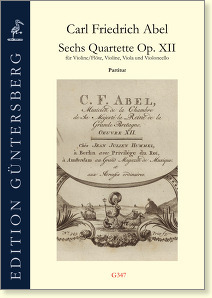 Carl Friedrich Abel, Six Quartets, Op. XII for violin/flute, violin, viola, and violoncello. G347 full score, G348 parts. 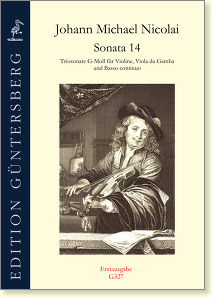 First Edition: Johann Michael Nicolai, Sonata 14, Trio Sonata in G minor for Violin, Viola da Gamba, and Basso Continuo G327. 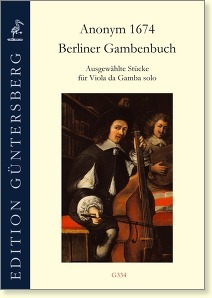 Selected pieces for viola da gamba solo from the Berliner Gambenbuch from 1674 G334.